The ISO setting adjusts the Nikon D5100’s sensitivity to light. At a higher ISO, you can use a faster shutter speed or a smaller aperture (higher f-stop number) because less light is needed to expose the image. But remember that a higher ISO also increases the possibility of noise. On the D5100, you can choose ISO values ranging from 100 to 6400, plus four Hi settings, 0.3, 0.7, 1, and 2, which stretch the ISO range from roughly 8000 (Hi 0.3) to 25600 (Hi 2). You also have the option of choosing Auto ISO; at this setting, the camera selects the ISO needed to expose the picture at the current shutter speed and aperture. Quick Settings screen: Press the Info Edit button to shift from the Shooting Info display to the Quick Settings display. Highlight the ISO setting and press OK to display the options shown on the right. Choose the desired ISO setting and press OK. 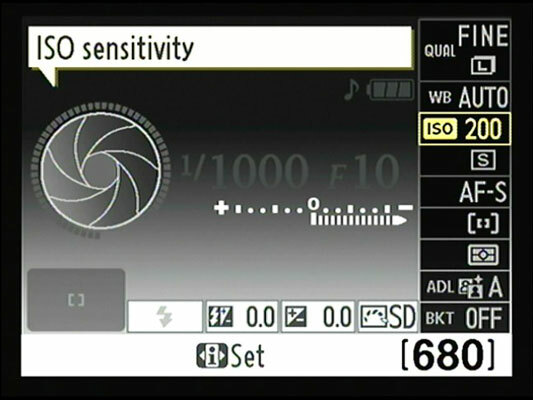 Shooting menu: You also can adjust the ISO Sensitivity Settings on the Shooting menu. Note that the second screen shows options available in the P, S, A, and M modes; you can access only the top option in the other exposure modes. Fn (Function) button: By default, pressing the Fn button on the side of the camera changes the Release mode to the Self-Timer setting for your next shot. But if you prefer, you can change the function of the button to provide one-button access to the ISO setting.